Pros Addictive gameplay, with multiple gameplay modes and both weekly and global leaderboards. Cons For so me, it may be a little confusing at first. Hexius is a unique and addictive game with a variety of game modes to suit any gamer’s play style. A quick glance at the gameboard may lead you to believe this is just another match-3 game, but it’s not. Instead Phasic Labs has developed a creative game with a style all it’s own. The basic premise is fairly simple. The screen is filled with a series of hexagons, each of which has a colorful geometric shape printed on top. 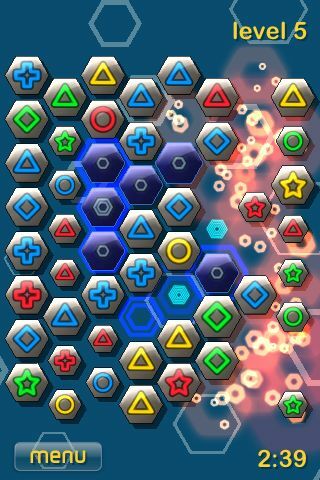 Tap on any one of the hexagons and now you must find (and tap) on all of the matching hexagons on the board. Connections will be drawn between the subsequently selected like-hexagons, “marking” any other hexagons in the path between the selected hexagons. Once you tap the final matching hexagon, all the marked ones will disappear, earning you points and possibly a few special hexagons as well (more about these in a bit). The board is replenished with new hexagons and the matching continues. Depending on how you create the connections between the selected hexagons, you can unlock Bomb, Reveal, Freeze, and Multiplier bonuses to help you maximize your score. Each of these bonus tiles has it’s own effect and do a very nice job of allowing more competitive players to get a rewarding and challenging experience from Hexius, by encouraging them to use a bit of strategy to earn big scores. Hexius has a total of three different game modes which offer a good variety of intensity and strategical elements. Time Attack Mode, Level Challenge Mode, and Strategy Mode. 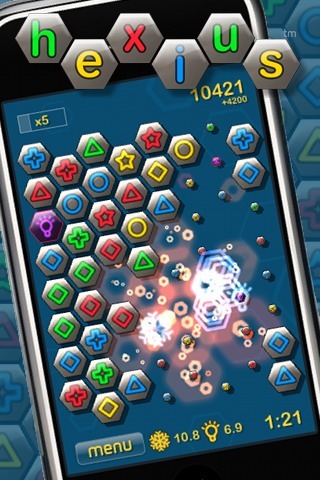 In Time Attack Mode, players must connect matching hexagons as quickly as possible until time runs out; the faster you play, the higher the score multiplier goes! In Level Challenge Mode players try to collect all of the targets to move onto progressively more difficult levels. The faster you complete a level, the more “spare” time is carried over to the next level, and when the time runs out the game is over. Finally, in Strategy Mode you can take your time, planning your moves to make the best use of your Multiplier bonuses to score as high as you can in 30 moves. Hexius is a universal app, meaning that you can play it on both your iPhone and iPad and experience the game’s bold colorful graphics and explosions in the native resolution of whichever iDevice you choose. Full OpenFeint integration with 21 Achievements and both weekly and all-time leaderboards for each of the game modes. The weekly leaderboards not only add a good deal of replayability, but also allow new players a better shot at earning a decent place on the leaderboard instead of appearing on the 20th page. I thought this was a particularly nice aspect that I’d like to see adopted by more games. If you enjoy match-3 games, but are getting tired of the same old swapping of tiles, Hexius offers a fun new twist on the genre with it’s connection style of gameplay. The best piece of advice that I can give you is read the manual! If you don’t you WILL be lost…guaranteed (take it from someone who didn’t). It takes just a few minutes, but after the tutorial, it should become clear. After playing, additional tips and hints will pop up, read these as well, as they will help you boost your score. With loads of replay value and a current sale price of 99¢, there is really no reason why you shouldn’t pick this one up.